When people talk about “a tough act to follow,” they usually refer to those rock bands who unwittingly book Jimi Hendrix as their opener, and yes, sometimes it refers to sequels not directed by the same filmmaker who made the original movie. Ridley Scott’s Alien might have been a hard act to follow if the sequel didn’t bring on James Cameron, fresh off The Terminator. Other sequel with new directors haven’t fared as well. With Hellboy, Lionsgate and Millennium Films have decided to keep the source material as Mike Mignola’s long-running comic but replaced Guillermo del Toro with Neil Marshall and Ron Perlman with Stranger Things’ David Harbour. Does it work? If you’ve read the title, you may already know the answer. The film opens in medieval England where we watch King Arthur defeat Nimue, the Blood Queen (Milla Jovovich) with his sword Excalibur, cutting her up into chunks and sending the pieces to the four corners of the kingdom. This segment is narrated so begrudgingly by Ian McShane, you have a feeling he knows the awfulness to come even as his character. We meet Harbour’s Hellboy on a trip to Tijuana, Mexico, where he has gone to retrieve a buddy and fellow agent of BPRD (Bureau for Paranormal Research and Defense) now posing as a luchador, who transforms into a giant bat when Hellboy steps into the ring with him. Later, his handler Professor Broome (McShane) – whom Hellboy calls his “Dad” – sends Hellboy on a mission to England to help the local Osiris Club defeat three murderous giants. Of course, the initial plan goes wrong and Hellboy soon finds himself trying to prevent the return of NImue. There’s something about the way Hellboy begins that makes you think that maybe this movie will remain faithful enough to Mignola’s comics to win over some new fans, but it’s also trying to follow on the heels of two movies by a far superior filmmaker working from better scripts. Some might wonder what sort of bills Lane must have racked up for her to feel the need to do this movie, but at least she gives it her all, unlike McShane. Some of his father-son moments with Harbour are just painful to watch, because there’s just no emotion on display. I’ve also seen Milla Jovovich do better work before, even in the Resident Evil movies, but her antagonist isn’t very well-developed, and she has very little to work with. Who knows who the great Stephen Graham wronged to end up voicing the pig-creature Gruagach, but it’s just par for the course in a movie that never really makes much of an effort to be better. The visual FX are terrible, but they’re used to create creatures who aren’t particularly well-designed anyway – there are a few exceptions–and the make-up and latex FX aren’t much better. The sets look cheap and chintzy. Thanks to the R-rating, the blood and expletives flow just as needlessly. Not that it matters, because the film comes across like it was written by a twelve-year-old whose parents left him unchecked to write Hellboy fan fiction on the internet. At its worst, the movie falls somewhere between Van Helsing (remember that bad movie classic?) and the Michael Bay Teenage Mutant Ninja Turtles movies. Sadly, you can’t even laugh at how bad the movie is, just because it’s so sad that this is the best filmmakers could come up with for a fairly decent comic book character. This new Hellboy is never funny. It’s never scary. It’s never anything even remotely resembling “cool.” It’s just a lame attempt to keep the character alive in movies without considering what made Mignola’s character (and del Toro’s movies) such beloved favorites in the first place. 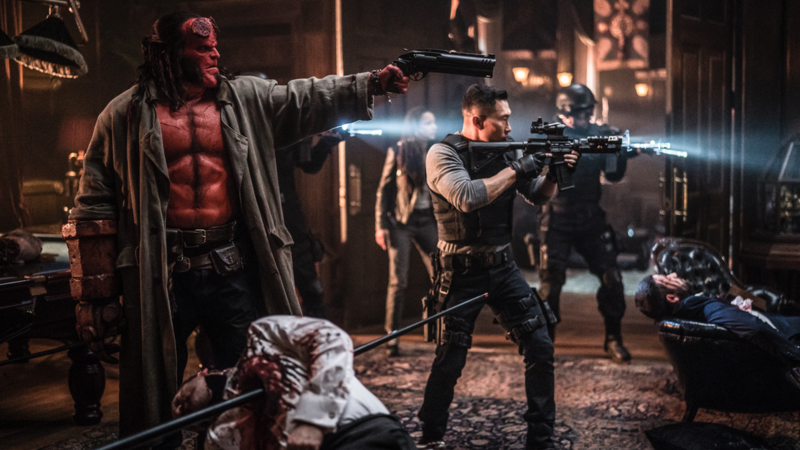 Hellboy might not be “Uwe Boll bad,” but it’s pretty damn close. A complete embarrassment. Well, it IS Uwe Boll bad. It’s actually worse than that, considering the talent involved. Mister Boll just can’t help himself… There’s nothing I can think of to defend this cinematographic abomination. This extremely ugly shot cosplay version of Mike Mignola’s Hellboy comic does not even attempt to tell a coherent story. The soundtrack consists of some out of place rock songs that are stuck in random places in the film. Unlike Del Toro’s films, there is no way of feeling any sympathy for the one-dimensional characters. The endless stream of silly one-liners and aimless quips make you realize that these annoyingly unpleasant characters have nothing to tell us over the course of two (!) excruciating hours. The movie simply jumps from ‘exposition piece’ to action scene and back again. And where Guillermo Del Toro created a tactile world with a balanced combination of practical effects work and sparingly used CGI, we are now saddled with special effects that look like the deleted scenes from a Playstation 3 game. Pah! I find it incomprehensible that Mignola believes that this soulless version is closer to the comics. I think the claim that the reader of the comics would be at peace with this turd is an insult. Eh. The last time a Guillermo Del Toro film did anything for me was The Devil’s Backbone. Hellboys, Pan’s Labyrinth and The Shape of Water were all cute fantasy that never really cut to the heart of anything for me (except perhaps for some nascent threshold between being a child and coming to know the horrors of life/the environment you’re in; which I’m not that interested in or enchanted by, as some people seem to be). I think Jim Henson had more to say, personally myself. I left out Pacific Rim as well. Clunker, clunky. I liked Blade 2 though. I’m a McShane fan. Forget F’ing Hellboy and Wednesday from fricking Gaiman. See McShane’s bit part in the recent British boxing flick, Jawbone. Or, just wait for the Deadwood movie. Roles and acting to care about. It NEGATES THE GOOD WILL of recent comic book movies? Is that really true? Or is it just a one-off, bad film? A Hellboy movie without Ron Perlman, and not directed by del Toro? Pass.